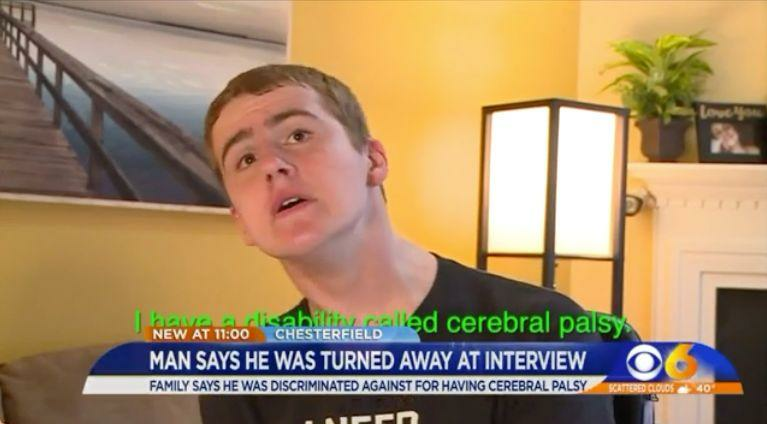 A Virginia teen with cerebral palsy is speaking out about a recent job interview, during which he says the store manager turned him away because of his disability. Chad Lowery is a 19-year-old from Chesterfield County who took to his Twitter account on Monday to share the upsetting result of his interview with a home decor store, Tuesday Morning. According to his posts, the manager of the Hancock Village location refused to conduct their scheduled interview after seeing that Lowery was disabled. Lowery wrote that the manager, whom he did not name, told him, “we don’t hire people with disabilities,” and wouldn’t even give him the opportunity to speak up for himself. “I’ve never been so insulted in my whole life,” he tweeted. Lowery did not immediately respond to Yahoo Lifestyle’s request for comment. However, Virginia station WTVR spoke with him and his parents, Gayle and Chris Lowery, who explained that the high school graduate was trying to do something that would allow him to feel independent. His father, Chris, explained that even when former employers felt that they might not be able to hire his son for a certain position, they have at least provided him an opportunity to interview. Chad, however, thinks that the situation goes beyond being “rude,” and instead displays a larger issue of discrimination — something which Tuesday Morning allegedly doesn’t condone. Despite the upsetting experience, Lowery told WTVR that he just wants a second chance to get the job. “If they offered me a job then I would accept it. I would like to prove them wrong,” he said. Chris Lowery added that when it comes to his persistent son, he’ll likely find a way to get that chance.